A highly readable personal finance book that translates financial jargon and enables readers to ask the tough questions to protect their money and their financial well-being In today's unsettled financial markets, where most pension plans died out with the twentieth century and where no one's certain of the future of Social Security, hardworking people turn to financial advisors to guide them to a worry-free financial lifestyle. But do you really know how to find a legitimate financial advisor? Do you understand the jargon advisors use to explain your investments? And most important, do you know the answers to the most critical questions that will affect your financial future: how much are advisors' fees, and just how safe are the investment choices they make on your behalf? Now more than ever, you need to educate yourself to prepare for your future, whether it's buying a house, paying for college, or saving for retirement. Spending quality time with What Your Financial Advisor Isn't Telling You is the first step to getting on track. 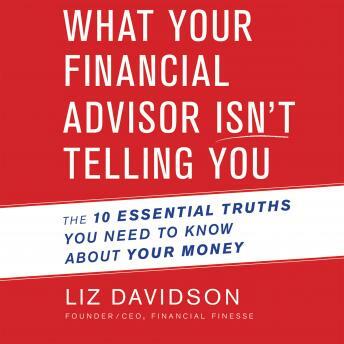 This book is a comprehensive guide to the essential unbiased information you need to make smart personal finance decisions and achieve total financial wellness.